True story: a friend of mine had just purchased a DJI Mavic Pro. He was flying it in San Francisco, and a few minutes in, the drone started flying away, out of his control. He tried to use the video footage recorded to his phone to hunt it down, but to no avail. The $1,000 he spent were lost. I can’t help but think, if he had taken this one simple precaution, this wouldn’t have happened! A GPS tracker for your drone. Trackimo has been making 3G GPS tracker devices for years — to give to kids or elderly relatives who might get lost, or to add to cars. But the company recently developed one specifically designed for drones. Trackimo’s 3G GPS Drone Tracker is about 1 ounce and sticks anywhere on your drone (typically the top is a good place to put it). Once activated, you can see on your smartphone app exactly where the drone has been. I attached it to my Mavic Pro and noticed no difference on my flight time or flying ability with the tracker on vs. not on. Each Trackimo device has 96 hours of battery life. The Trackimo device updates 1 per minute, so it’s not intended to be used to log your flight. However, in the event of a crash, your drone will be in that spot for longer than one minute, so those intervals would work well for its intended purpose. I even tried Trackimo on a cheap toy drone! This did seem to affect the flight time, though it didn’t on the Mavic Pro. I loved how easy this was to install — it’s a simple stick-on tracker that is small enough to fit on most drones. But what’s also incredibly convienient about this tracker is that it doesn’t HAVE to be used just for drones. While I’m the Drone Girl, I’m NOT flying drones 24/7, yet there are other things I’d like to use this tracker for, whether it’s putting on your pet’s collar while playing in the park or for me, mounting on my bike (I DO live in San Francisco where bike theft is extremely common). I can easily transfer it from my bike to my drone. The Trackimo GPS drone tracker is typically $219, but is on sale for $139 (plus free shipping). That comes with a SIM card loaded onto the Trackimo with 1 year international cellular service. Many drone insurance plans do not cover flyaways. In the case of my friend, he was left with $1,000 less and no drone. Do you use tracking devices on your drone? Good idea or no? Leave a comment below! 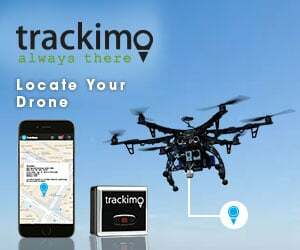 Purchase the Trackimo GPS drone tracker here. I can now surely secure my drone for our next trip! Some piece of mind that your flyaway drone will be found! Got this device for my drone. I’m all set for flying hopefully it meets the expectation. Same here. Goodluck! The device takes time to map out during first use. When you give it time, and it has mapped the area outdoors, you’re good to go! The best thing about this device is when I attach it to the drone, it doesn’t hinder the drone’s flight pattern which is what something I can’t expect from other devices. Using a tracking device is just practical, for a quite expensive toy we can’t make sure the flight goes as planned and it’s better to have an alternative. I got a Trackimo device too and it works very well. I’m flying my drone with less worries. I take caution by mounting the mentioned tracking device too for that reason. I’ve been using this tracker when I fly my drone, very reliable I must say. It works really well, one instance was when my drone got out of sight and landed in areas with fairly many trees, the tracker helped me locate the place and glad to have bought this little device. So glad that you’ve come up to use trackimo. To be honest this device gives me the best service and what’s more awesome is it is now on 3G! I don’t have regrets purchasing this device. Never thought I could secure my drone. Thanks to this device, now I can fly my drone and I’m sure it’s safe because of trackimo. What I like most if trackimo is, it is very convenient and easy to use. And if we talk about battery it will last up to 20-30 days. Very amazing! Got this device last month and it’s working on how I expected it to be. Now my drone is up for flying and I’m not worried anymore because of trackimo. Trackimo is one of my very useful device. I’m more confident of my drone knowing that I have put trackimo on it. The device is really accurate especially in open areas, and it runs on 3G signal too so what’s not to like! Trackimo is very helpful for a first time drone user like me, aside from it’s reliability it is also a lightweight device. Trackimo is now my best friend! It helps my drone safe and it works best in any areas. Thanks for recommending this device, now I own one and I’m pleased with it. It is lightweight and works for my drone just well. Having a GPS tracker really makes the flying experience better and fun. No more worries of losing a drone in case something goes off course. This 3G GPS Trackimo tracking device serves me well for securing my drone’s fly away incidents. This product help me to locate my drone any where at any time. Trackimo Tracking Device has been so helpful with any questions I’ve had and responsive! The tracking answered my questions about the whereabouts of my Drone! Would use them again! I use this as an emergency locator for a drone in case of a fly-away or crash. Easy setup, good instructions, reasonable monthly plans. Works as advertised. I can get location updates on my iPhone or computer, and they are extremely accurate–generally within 20 feet or so. It’s also smaller and lighter than I anticipated which is great. Highly recommend. The Trackimo 3G GPS tracker enabled me to find a UAV plane that I crashed at high speed about 1/2 mile away in a very heavily wooded area. I don’t think we would have ever found the plane without help from this tracker. The crash utterly destroyed the plane, camera, and many components, but the Trackimo tracking unit survived long enough to do its job, although it will not take a charge now. If you have a drone you care about this little wonder is worth the investment. I am buying a new one to replace the first one.